Ever Heard of Bear’s Breech? Right now the most spectacular plant in my garden is hand's down my Bear's Breech. 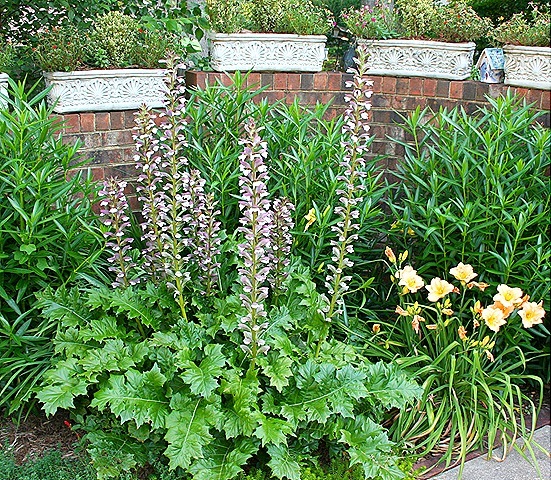 Also known as Acanthus, this mediterranean plant is a real traffic stopper. Super easy to grow you will typically find this perennial in the shade section of your garden center, however my plant sits in the full sun all day and loves it! This plant is very drought tolerant and also evergreen. That pretty much makes in perfect in my book. Even if you have never heard of Bear's Breech, surely you are familiar with it's other name, Acanthus. Leaf borders and scroll motifs were common and prolific in the art and architecture of ancient Greece and Rome. Foremost of these was the acanthus motif. Right now is the perfect time to pick up one of these beauties at your favorite garden center. I’ve wanted one of those for my garden for ages – seeing how gorgeous yours is will make me head to the garden center this weekend! I’m recently back from my African safari – the most awesome trip I’ve ever taken. Every moment was a wonderful new experience, and being with my three Brit girlfriends was such fun – we were told we were ‘memorable’ at each camp where we stayed!! Hope you have time to stop by and see my animal photos Suzy -mhave some great ones! Happy weekend – hope all is well. That is a beauty. Cornell Plantation (at Cornell University) uses that as their “signature plant” – they use it all over the place and it’s just beautiful. Thanks for reminding me I need one of those! p.s. I actually came back to comment on the fish – I loved the one you first saw, too, but it never occurred to me to actually make one! I have a few of those and none of them look as good as yours. I’m so jealous. Mine are mostly in the shade and seem to always look wilted. I’m in the same climate zone as you (Newport News), and we haven’t had much rain, so I thought that was why mine look so yucky. But you consider it drought-tolerant, so I’m stumped. Maybe I need to transplant one into a sunny spot, like yours, and see what happens. It certainly is beautiful. 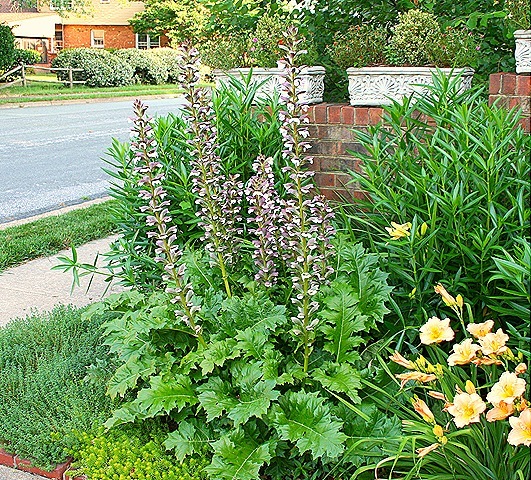 I’ve never seen an Acanthus in anyone’s garden around here, but thanks to you, I might have some in my garden soon…..I just love your example, and the fact that it is so prominent in architecture. Very classy plant! You make it all look soooo easy! Stunning! How hearty is it? Is that a perennial of annual…it really is a show stopper…gorgeous! I’m always looking for plants that do well in shade. Your Bear’s Breech is lovely! I will look for it the next time I head to the garden center. I love this plant but the deer keep eating mine! I didn’t think they would especially since I planted it in a very awkward little space near the edge of the pond that is hard to get to. Yours is gorgeous!